Time to start singing the abc song! As you peruse these alphabet tracing pages you’ll find they’re all here, from a-z, apple to zipper. Each tracing page has a picture and name of an object that begins with that letter. 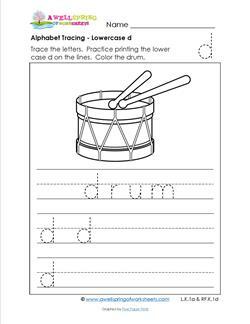 Kids trace the word as neatly as possible, trace the letters, and write a few more letters for practice. I would suggest at least five letters per line. Then they can color the simple pictures to their hearts content! 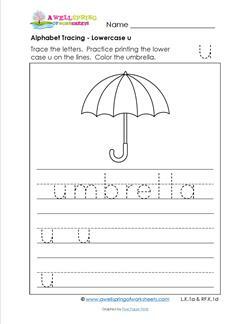 26 alphabet tracing pages for lowercase letters. A is for apple! And this one is nice and big and round. 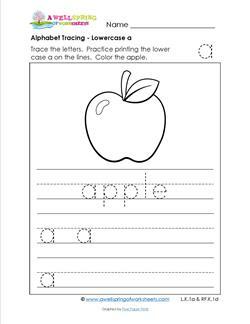 Trace the word apple and the letters, and practice more alphabet tracing for the letter a. Color the apple. Do you feel a nice warm breeze? Perfect day for a boat ride! 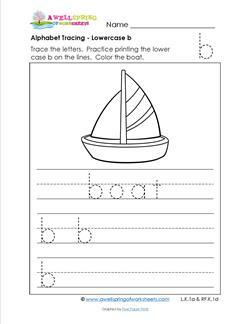 Trace the word boat and practice alphabet tracing the letter b. Then write a few more b's and color. This little car is as cute as a button. It's the kind of car I wanted when I was a teenager! 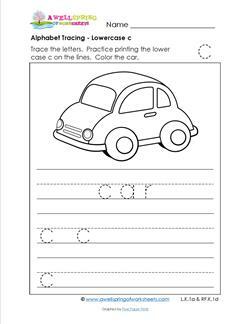 Trace the word car and the c's, then practice writing more letter c's. Color. Ba rum pa pa pum. Yes, you can have as much fun tracing and writing lowercase d's as you could have banging (oops! ... playing) on the drums. Doesn't this little cutie just make you want to say, "Awww"? 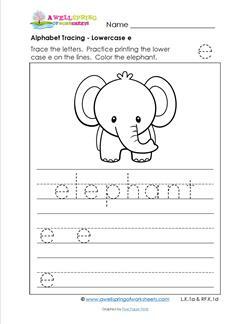 Have your kids trace the word elephant and each lower case e. Write some more and color. Talk about big eyes, this frog has some big ones looking right at you! 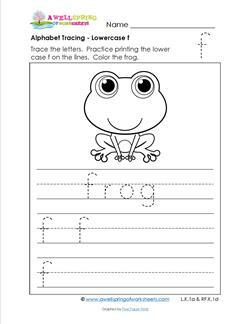 Trace the word frog and each lowercase f on this alphabet tracing page. Write more letters, too. Grapes anyone? 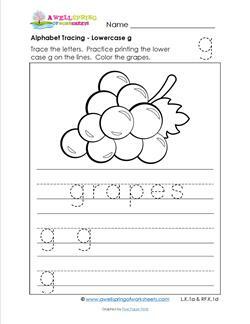 Nice and big and juicy looking, these grapes are the fruit of the day to go with the alphabet tracing letter on this page - lowercase g! This fun and adorable little hippo is giving you that sweet look! Go ahead. Make his day. 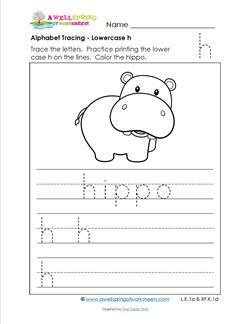 Print out this page and trace the word hippo and each lowercase h.
So the question is ... what color do you color an igloo? 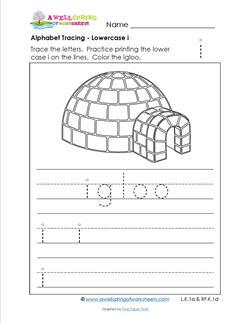 You'll need to color after tracing each lowercase i, and the word igloo, of course. Write some more letters. 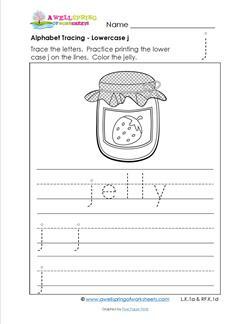 This alphabet tracing page for lowercase j has a picture of an old fashioned jar of jelly. Yummy! Trace the word jelly and each lowercase j, write more letters, too! Are you ready to fly a kite? 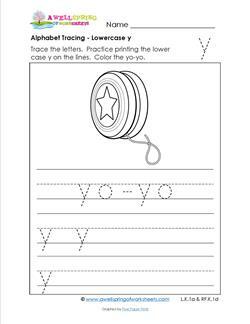 You can at least pretend while you are tracing the alphabet letters on this lowercase k page. 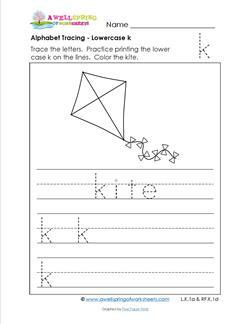 Trace the word kite, then color away! This frisky and playful little lion is sure to get your kids smilin'. Tracing alphabet letters is fun when you're happy! 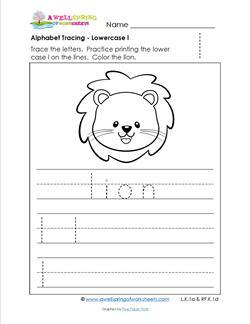 Trace the word lion and each lowercase l.
This sneaky mouse has made it front and center onto this lowercase m alphabet tracing page. 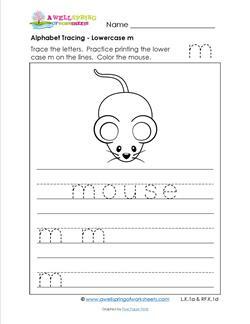 Kids trace the word mouse, the letter m, and then get to color. This nice round nest leaves us wondering what kind of eggs these are. Any guesses? 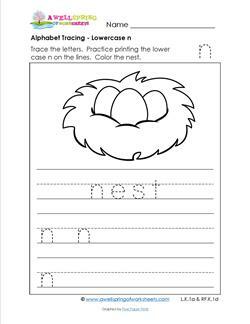 Kids trace the word nest, the letters, write more letters and color. This bright and cheery fella swam right over when he heard the lowercase o needed an o word. 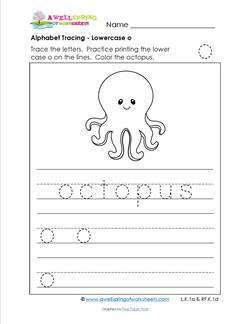 Trace the word octopus, the letter o's, write more o's and color. Here is a cute little pig, innocent as can be, just waiting for someone to trace the word pig, write some p's and color him in. 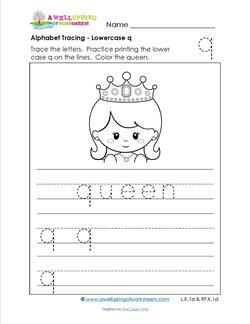 Just like a little girl all dressed up, this little queen is adorning this lowercase q alphabet tracing page. Trace the word queen and the q's, and color her in. 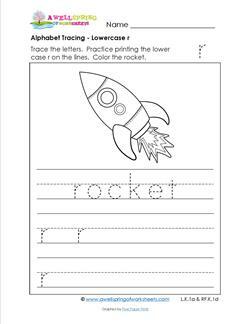 The rocket on this alphabet tracing page should get kids blasting off with energy to trace the word rocket and the lowercase r's, writing even more r's and coloring. Let the sun shine in! Into this lowercase s alphabet tracing page, that is. 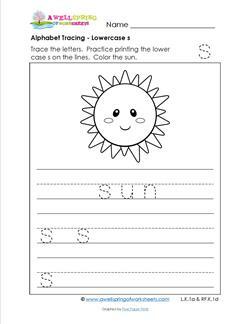 Trace the word sun & each lowercase s. Practice more by writing more letters. Color. Firm and solidly growing as this fruit tree is what your kids will be as they practice tracing their alphabet letters. 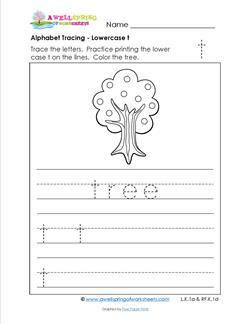 Trace the word tree and the letters then color. Whether to use for shade or the rain, an umbrella is a nice thing to have around. It comes in handy, too, with this alphabet tracing page! Ready for a big explosion? 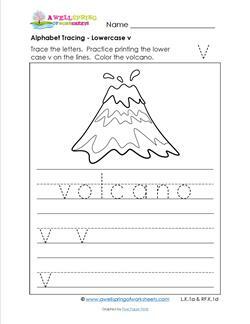 Not from this volcano, but in your kids tracing skills! Have them trace the word volcano, the letters, and color, too. This sweet little whale looks like he could be a bathtub toy! But alas, he's not. He's here for kids to color and to trace the word whale. Trace the w's, too. Well here's a fine little chap who volunteered to get his x-ray taken. Would you volunteer? 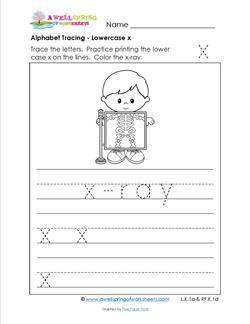 We're looking for is kids to trace the word x-ray & the x's & to color. It seems like there's at least one kid at every school who's a yo-yo whiz. Is there one at your school? 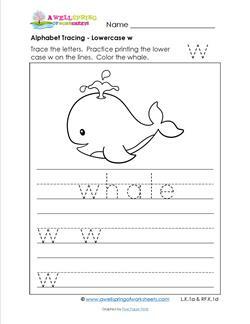 You could show him your finished alphabet tracing page! Get that zipper pulled all they way up! ZIP! Great job! 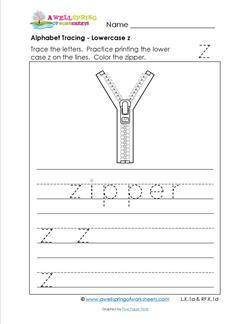 You thought that was easy, now get your little fingers around a pencil & trace the word zipper.